A modern interpretation of Azazel as a Satanic, goatlike demon, from Collin de Plancy's Dictionnaire Infernal (Paris,1825). Azazel was either a mysterious desert demon to whom the ancient Israelites sacificed a scapegoat on the day of Yom Kippur, or else a rugged cliff upon which the scapegoat was cast down to atone for Israel's sins. The only mention of "Azazel" in the Torah is found in the Book of Leviticus, which describes God ordering the high priest Aaron to "place lots upon the two goats, one marked for the Lord and the other marked for Azazel" (16:18). Aaron was to confess over the second goat all the iniquities and transgressions of the Israelites and then set the goat free in the wilderness (Lev. 16:21-22), likely throwing it over a cliff. Most rabbis (fearing contamination from polytheism) interpreted "Azazel" as the rugged mountain cliff from which the scapegoat was cast down on Yom Kippur, but some (such as Nachmanides) argued that Azazel belongs to the class of "se'irim," goat-like demons haunting the desert, to which the Israelites were wont to offer sacrifice. Both views have been variously endorsed and debated in Jewish tradition. Viewed as a demon of the desert, Azazel seems to have been closely interwoven with the Book of Enoch as the seducer of men and women, and leader of the rebellious hosts (Yoma 67b). The word Azazel (‘ăzaz’ēl) derives from the Hebrew roots ‘ăzaz ("to be strong") and ’ēl ("God"). "God has been strong," "God strengthens," or "strong one of God." According to some scholars, however, this compound could also figuratively mean "impudence" (i.e., strengthened against someone) or "impudent to God." Alternatively, the name may refer to the rugged and strong mountain cliff from which the goat was cast down. Azazel was translated as "scapegoat" in the King James Version of the Bible (1611), which relied upon William Tyndale's translation of the Bible about 1530 that split azazel into the component parts ez ozel: literally, the "goat that departs," hence "the goat that escapes." Since this goat, with the sins of the people placed on it, was then sent over a cliff or driven into the wilderness to perish, the word "scapegoat" came to mean a person, often innocent, who is blamed or punished for the sins, crimes or sufferings of others. According to Talmudic interpretation, the term "Azazel" designated a rugged mountain or precipice in the wilderness from which the goat was thrown down, using for it as an alternative the word "Ẓoḳ" (Yoma vi. 4). "Azazel" is regarded as a compound of "az," strong or rough, and "el," mighty, therefore a strong mountain. This derivation is presented by a Baraita, cited Yoma 67b, that Azazel was the strongest of mountains. The Talmud (Yoma 67b) identifies Azazel as the name of a cliff over which a goat was driven in the atonement ritual for Yom Kippur. This version was cited by the biblical commentator Rashi, who took "azazel" to mean "rough ground" or "cliff," and this meaning was accepted by many Jewish commentators who wished to avoid contamination of the Torah by traces of polytheism or the belief in demons. Ibn Ezra took "Azazel" to refer to "a mountain near Sinai," while G. R. Disker took the "rough ground" to be Dudael, a rocky place where the fallen angel Azazel is imprisoned" (I Enoch 10:4-6). It has also been identified with Hudedun, "a rocky terrace in the wilderness, ten miles from Jerusalem." The first appearance of the name "Azazel" is in the Book of Leviticus 16:8, when God orders the high priest Aaron to "place lots upon the 2 goats, one marked for the Lord and the other marked for Azazel" on the Jewish Day of Atonement. The goat designated by lot for the Lord is to be used as a sin offering, while the goat designated for Azazel "shall be left standing alive before the Lord, to make expiation with it and to send it off to the wilderness to Azazel" (Lev. 16:10). Aaron was to "lay both his hands upon the head of the live goat and confess over it all the iniquities and transgressions of the Israelites, whatever their sins, putting them on the head of the goat; and it shall be sent off to the wilderness by someone designated for the task. Thus the goat shall carry on it all their iniquities to an inaccessible region; and the goat shall be set free in the wilderness" (Lev. 16:21-22). Leviticus also says that "He who set the goat for Azazel free shall wash his clothes and bathe his body in water; after that he may reenter the camp" (16:26). Two goats were procured, similar in respect of appearance, height, cost, and time of selection. Having one of these on his right and the other on his left (Rashi on Yoma 39a), the high priest, who was assisted in this rite by two subordinates, put both his hands into a wooden case, and took out two labels, one inscribed "for the Lord" and the other "for Azazel." The high priest then laid his hands with the labels upon the two goats and said, "A sin-offering to the Lord" using the Tetragrammaton; and the two men accompanying him replied, "Blessed be the name of His glorious kingdom for ever and ever." He then fastened a scarlet woolen thread to the head of the goat "for Azazel"; and laying his hands upon it again, recited the following confession of sin and prayer for forgiveness: "O Lord, I have acted iniquitously, trespassed, sinned before Thee: I, my household, and the sons of Aaron Thy holy ones. O Lord, forgive the iniquities, transgressions, and sins that I, my household, and Aaron's children Thy holy people committed before Thee, as is written in the law of Moses, Thy servant, 'for on this day He will forgive you, to cleanse you from all your sins before the Lord; ye shall be clean.'" This prayer was responded to by the congregation present. A man was selected, preferably a priest, to take the goat to the precipice in the wilderness; and he was accompanied part of the way by the most eminent men of Jerusalem. Ten booths had been constructed at intervals along the road leading from Jerusalem to the steep mountain. When he reached the tenth booth those who accompanied him proceeded no further, but watched the ceremony from a distance. When he came to the precipice he divided the scarlet thread into two parts, one of which he tied to the rock and the other to the goat's horns, and then pushed the goat down (Yoma vi. 1-8). The cliff was so high and rugged that before the goat had traversed half the distance to the plain below, its limbs were utterly shattered. Men were stationed at intervals along the way, and as soon as the goat was thrown down the precipice, they signaled to one another by means of kerchiefs or flags, until the information reached the high priest, whereat he proceeded with the other parts of the ritual. The scarlet thread was a symbolical reference to Isaiah i. 18; and the Talmud tells us (Rashi on Yoma, 39a) that during the forty years that Simon the Just was high priest, the thread actually turned white as soon as the goat was thrown over the precipice: a sign that the sins of the people were forgiven. In later times, the change to white became less frequent and was seen as evidence of the people's moral and spiritual deterioration. Forty years before the destruction of the Second Temple, when the change of color was no longer observed (l.c. 39b). Far from involving the recognition of Azazel as a deity, the sending of the goat was, as stated by Nachmanides, a symbolic expression of the idea that the people's sins and their evil consequences were to be sent back to the spirit of desolation and ruin, the source of all impurity. The very fact that the two goats were presented before God before the one was sacrificed and the other sent into the wilderness, was proof that Azazel was not ranked with God, but regarded simply as the personification of wickedness in contrast with the righteous government of God. The rite, resembling, on the one hand, the sending off of the epha with the woman embodying wickedness in its midst to the land of Shinar in the vision of Zachariah (v. 6-11), and, on the other, the letting loose of the living bird into the open field in the case of the leper healed from the plague (Lev. xiv. 7), was, indeed, viewed by the people of Jerusalem as a means of ridding themselves of the sins of the year. Likewise the crowd, called Babylonians or Alexandrians, pulled the goat's hair to make it hasten forth, carrying the burden of sins away with it (Yoma vi. 4, 66b; "Epistle of Barnabas," vii. ), and the arrival of the shattered animal at the bottom of the valley of the rock of Bet Ḥadudo, twelve miles away from the city, was signalized by the waving of shawls to the people of Jerusalem, who celebrated the event with boisterous hilarity and amid dancing on the hills (Yoma vi. 6, 8; Ta'an. iv. 8). Evidently the figure of Azazel was an object of general fear and awe rather than, as has been conjectured, a foreign product or the invention of a late lawgiver. "The Azazel goat was to atone for the wicked deeds of 'Uzza and 'Azzael, the leaders of the rebellious hosts in the time of Enoch" (Tanna d. b. Rabbi Yishma'el: Yoma 67b); and still better from Midrash Abkir, end, Yalk., Gen. 44, where Azazel is represented as the seducer of women, teaching them the art of beautifying the body by dye and paint (compare "Chronicles of Jerahmeel," trans. by Moses Gaster, xxv. 13). According to Pirke De-Rabbi Eliezer xlvi. (comp. Tos. Talmud tractate Megillah 31a), the goat was offered to Azazel as a bribe that he who is identical with Samael or Satan should not by his accusations prevent the atonement of the sins on that day. Pirke de Rabbi Eliezer (l.c.) identifies him with Samael; and the Zohar Ahare Mot, following Nachmanides, with the spirit of Esau or heathenism; still, while one of the chief demons in Kabbalah, he never attained in the doctrinal system of Judaism a position similar to that of Satan. The corruption brought on by Azazel and the Grigori degrades the human race, and the four archangels (Michael, Gabriel, Raphael, and Uriel) “saw much blood being shed upon the earth and all lawlessness being wrought upon the earth […] The souls of men [made] their suit, saying, "Bring our cause before the Most High; […] Thou seest what Azazel hath done, who hath taught all unrighteousness on earth and revealed the eternal secrets which were in heaven, which men were striving to learn." Raphael's binding of Azazel on the desert rocks of Dudael in upper Egypt appears again in the Book of Tobit, which is found in Catholic and Orthodox bibles, but not in Jewish or most Protestant bibles. In that Book (the only place in Christian bibles where Raphael appears) he accompanies the young man Tobias (Tobit) on his perilous journey to marry his cousin Sarah, whose seven previous husbands had been killed on her wedding night by the demon Asmodeus. Raphael saves Tobias from the same fate by showing him how to deal with that demon, too. In 3 Enoch, Azazel is one of the three angels (Azza (Shemhazai) and Uzza (Ouza) are the other two) who opposed Enoch's high rank when he became the angel Metatron. Whilst they were fallen at this time they were still in Heaven, but Metatron held a dislike for them, and had them cast out. They were thenceforth known as the 'three who got the most blame' for their involvement in the fall of the angels marrying human women. It should be remembered that Azazel and Shemhazai were said to be the leaders of the 200 fallen, and Uzza and Shemhazai were tutelary guardian angels of Egypt with both Shemhazai and Azazel. They were responsible for teaching the secrets of heaven as well. The other angels dispersed to 'every corner of the Earth'. Another strange passage in 3 Enoch states that while the bodies of the angels would burn and die 'their souls would be with God' and the water would turn to ice 'which would be for their healing' though they did not know it. In the extracanonical text the Apocalypse of Abraham, Azazel is portrayed as an unclean bird who came down upon the sacrifice that Abraham prepared. (This is in reference to Genesis 15:11: "Birds of prey came down on the carcasses, but Abram drove them away" [niv]). And it came to pass when I saw the bird speaking I said this to the angel: "What is this, my lord?" And he said, "This is disgrace—this is Azazel!" And he said to him, "Shame on you, Azazel! For Abraham's portion is in heaven, and yours is on earth, for you have selected here, [and] become enamored of the dwelling place of your blemish. Therefore the Eternal Ruler, the Mighty One, has given you a dwelling on earth. Through you the all-evil spirit a liar, and through you wrath and trials on the generations of men who live impiously (Abr. 13:4-9). He is also associated with the serpent (Satan) and hell. In Chapter 23, verse 7, he is described as having seven heads, 14 faces, "hands and feet like a man's [and] on his back six wings on the right and six on the left." In these passages, there is the idea that God's heritage (the created world) is largely under the dominion of evil—i.e., it is "shared with Azazel" (Abr. 20:5), again identifying him with Satan, who is also "the prince of this world" (John 12:31, niv). In modern Hebrew, Azazel is a synonym for the word Hell, and the saying "lekh l'Azazel" (לך לעזאזל) is the equivalent of the English curse "Go to Hell!" Azazel is often described as one of the world's first evils, and is commonly placed high in Hell's hierarchy. 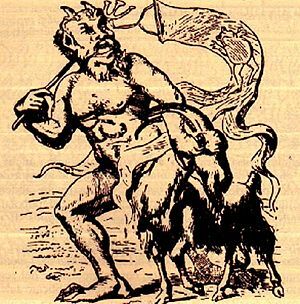 Some use Azazel as a synonym of Satan, but others are of the opinion that they are separate entities, though many agree that Satan's traditional satyr-like appearance is most likely originally based on Azazel, since Azazel was often said to appear similar to that of Eliphas Lévi's depiction of Baphomet, as that of a goat with human disposition, often with a pair of leathery wings. Some also identify Azazel with "The Beast" or as "The Dragon" from Revelation. According to the Book of Enoch, Azazel is the chief of the Se'irim ("the hairy ones"). The Se'irim are goat-demons who haunted the desert and to whom most primitive Semitic tribes offered sacrifices. Jeroboam may have appointed priests for the Se'irim (2 Chron 11:15), but that Josiah destroyed the places of their worship (2 Kgs 23:19). The Se'irim are mentioned in Leviticus 17:7 and 2 Chronicles 11:15. Additionally, Isaiah 34:14 says that the Se'irim greet each other among the ruins of Edom along with Lilith and other wild beasts. Collin de Plancy's Dictionnaire Infernal (1863) describes Azazel as the guardian of goats. On the 10th day of Tishri, on the feast of the Expiation, it was Jewish custom to draw lots for two goats: one for the Lord and the other for Azazel. The goat for the Lord was then sacrificed and its blood served as atonement. With the goat for Azazel, the high priest would place both of his hands on the goat's head and confess both his sins and the sins of the people. The goat ("scapegoate") was then led into the desert and set free. Azazel then returned the goat. Azazel is invoked or referenced in a number of works in different media, including books, music, comic books, games, movies, and television. A complete list is beyond the scope of this article. Classically, Cornelius Agrippa lists four fallen angels as the opposites of the four holy rulers of the elements; among them is Azael, who is chained in a desert where he will remain until the day of judgment. Perhaps the most notable descriptions, though, are the references made to him by the Romantic poets: Azazel (described as "a cherub tall") is a fallen angel and Lucifer's standard bearer in John Milton's Paradise Lost, and is one of the angels in Lord Byron's drama Heaven and Earth. Milton described Azazel as the first gate-teacher of the infernal armies. Azazel is also the name of the demon that serves Mark the heretic. Among twentieth century authors, the name Azazel has been used for characters by writers as diverse as Mikhail Bulgakov, Isaac Asimov, Salman Rushdie and Boris Akunin. In visual media, Azazel appears as a body-hopping demon spirit in the film Fallen, and is the main character in the British television science fiction series "HEX." He also appears in the ABC Family MiniSeries, "Fallen." ↑ See Yoma 67b; Sifra, Aḥare, ii. 2; Targum Jerusalem Lev. xiv. 10, and most medieval commentators). Ibid. ↑ cf. "Chronicles of Jerahmeel," trans. by Moses Gaster, xxv. 13. ↑ Jewishencyclopedia.com: Azazel.Retrieved February 18, 2008. ↑ Ibid..Retrieved February 18, 2008. ↑ Gunther Plaut, and David E. S. Stein. The Torah, A Modern Commentary. (Union for Reform Judaism, 2005), 1735, note 4. ↑ Jewishencyclopedia.com: AzazelRetrieved February 18, 2008. ↑ Angels are made of fire. Agrippa, Cornelius. Occult Philosophy or Magic. York Beach, ME: Samuel Weiser Inc., 1973.